Love both these looks. Always looking super duper cute. I am so bummned I don't have an H&M by me- dying for that top. Both are lovely looks. Great yellow shorts and H&M top. can you join blovlovin so it's easier us to follow you? love love LOVE your style! spring is a beautiful time. And it's spring and summer in Hawaii all the time... except now I'm cold when the wind blows. LOLOL. You look so radiant and fresh. Loving it. Beating the heat and looking so fresh, Khatu. totally diggin' that peplum top. When I kicked this cold to the curb, I plan on making me something similar to it. I just need more rest. Hope you've been great, hun. Love both of the looks!!! Hat hat hat! Love how the black and white lets your head 'take a break' from the colors of the outfit. love both of them - especially that white bag!! both looks are amazing!!! you styled them perfectly! 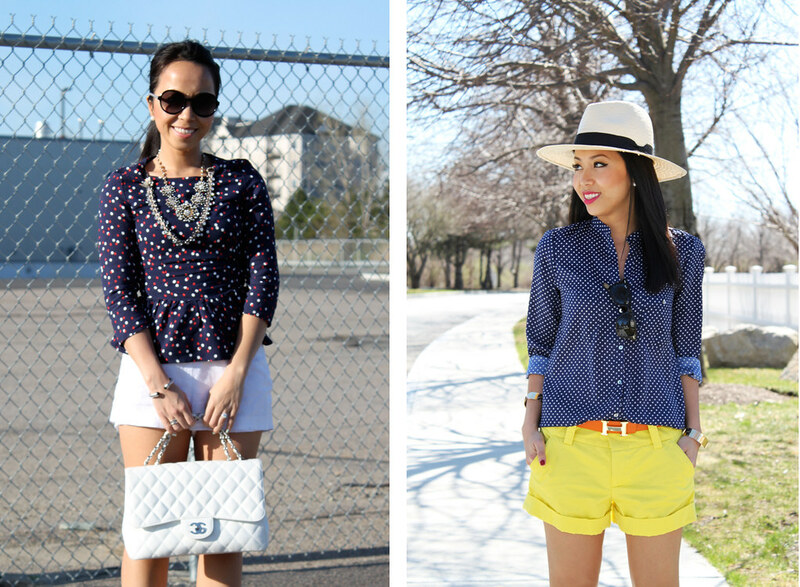 Love your little polka-dot peplum top! So cute. Love both of these looks! You look precious!